As we’re fond of doing from time to time, we’ll take a tool and put it into the hands of a tradesman who really knows how to use it. That way we can see how they use a new tool in the field. This is especially appropriate when we don’t have an application in-house from which we could benefit from using the tool ourselves. When we got a hold of the Paslode CR175C cordless roofing nailer, we had just finished up a couple of roofing projects of our own, so we were hoping to put it into somebody’s hands who could really give it an extended run. That’s when we called up Robbie Sanger, owner of High Tower Roofing and someone who works on both residential and commercial buildings here all over town. Pro Tool Reviews (PTR): Tell us a little bit about what you do? Robbie Sanger (Robbie): We tackle all types of roofing, both residential and commercial. We work all over Lakeland, but we also extend out to the west side of Orlando and then all the way back over to Sarasota. In addition to new roofs, we’ll also do remodels and even some repair work. PTR: How did you become a roofer? Robbie: (Laughs) Actually, I came out of college and started working for Publix (a large grocery store chain). After Publix discovered I wasn’t a “cubicle” guy, I landed a job with a roofing company. I worked there for 3 years until the company went out of business, and that’s when I decided to start my own. High Tower Roofing now has 11 guys, and as I mentioned, we cover a large chunk of West Central Florida. Robbie: I thought this would be a great tool for repairs—for something quick, so that you didn’t have to pull out the compressors and hoses. It’s got a different feel. You have to let it ramp up, but once it gets going it works great. There is a slight learning curve to getting that first nail out, but it doesn’t take long before you get into the groove. Once the fan motor is running, you can get it going right away with no delays. I also like how the nail guard is constructed. It seems to be built really well. Lots of times the cover that you flip over to hold the nails in breaks because it’s plastic. After that it just flips open on you, which is why a lot of my guys have rubber bands on theirs. This one snaps shut really well and looks like it’ll last longer. PTR: How’s the weight and size of the Paslode CR175C roofing nailer compared to the pneumatic tools you use normally? Robbie: I did notice that it’s a little heavier than a traditional pneumatic nailer. It’s also bulkier, but you can get used to it. It has a fairly large battery compared to their new framing and finishing nailers which use lithium-ion. The trade-off, of course, is that there are no hoses, and there’s no compressor. You just pull the gun out and do whatever repairs you need to do. In fact, that’s about the only thing I regretted immediately. Robbie: Well, for some of the roofing repairs we were doing, we also needed a framing nailer to fix the structural wood. PTR: Ah…I could see the need for that. Robbie: Yeah, so I ended up buying the Paslode framing nailer in the course of this review because it just made sense to have both. PTR: Wow. So we sold you on a tool you weren’t even reviewing. I guess that actually makes a lot of sense. Robbie: Yeah, without a cordless framing nailer, you end up pulling out a compressor and a hose anyway. You really need both a cordless roofing nailer and a cordless framer, or it kind of defeats the purpose of using it on a lot of repair work. PTR: So tell me about the differences between the Paslode CR175C and a pneumatic. What’s different about it (good or bad) from conventional pneumatic roofing nailers? Robbie: Well, for a larger job I don’t think it would be cost effective. I mean each canister pushes 1000 nails. Six nails a shingle means that for a large job, you’re going to spend more time on a roof than you need to. With the added time, the weight is going to come into play, if you end up using it all day long. 4.5 to 5.5 pounds is about the normal weight of a roofing nailer. This weighs like 8 pounds with nails. After a day of using this, your arm would probably be pretty sore. So while it may not be what you want to use for a big job, it really cuts down what you need to bring for a repair. You can literally fit everything you need into the back of a pickup truck—including the trash from the roof repair you’re doing. I could literally eliminate a trailer from a repair job by using this tool. We asked Warren Corrado, Paslode Market Manager, why the company has so many different types of fuel canisters for their cordless nailers. After all, isn’t combustion the same all around? His response was helpful. “You’re correct that ‘combustion is combustion,’” says Warren, “but to achieve correct combustion and optimize power through a broad range of temperatures, we need to tailor the fuel dosage to the specific tool.” So while the fuel cell for the trim tool and roofing tool look similar, realize that they each have their own unique dosage to ensure the best performance. PTR: What projects did you end up using the Paslode cordless roofing nailer on? Robbie: We did a repair job where we had a bad skylight, and we ended up having to replace some roof decking and pull up all the shingles around the glass. 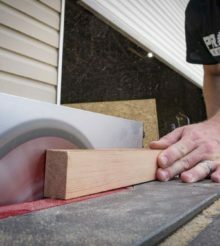 When we got into it we found out there was bad wood and ended up having to get a compressor out…after all of that, I bought the Paslode cordless framing nailer. We definitely had no problems shooting through the thick flashing with the roofing nails. It was pretty solid. We also did a valley repair that called for us to replace some plywood. All we needed was an extension cord and a saw. The Paslode framing nailer and the roofing nailer were able to take care of the entire job for us. PTR: Is there anything about the tool that you’d like to see improved upon? Robbie: Well, the availability of the Quicklode fuel and ease of getting it could be improved. The fuel is proprietary for the roofing nailer, and it’s even different from the trim fuel that’s more readily available. You just have to know where to get it or plan ahead. As I mentioned earlier, the tool could benefit from going to lithium-ion and shaving off a few pounds, which would hopefully reduce its size. PTR: OK, now it’s time for the big question: Would you recommend this tool to other professionals? Robbie: Oh I definitely would—especially if you’re concerned with minimizing your supplies or are limited to what you can haul to a job site. It would be great for a company that had its own service crews. If you’re doing a lot of repair and service jobs, I’d think this would come in very handy. PTR: What do you think about the value of this tool (price vs. performance)? Robbie: For a regular nail gun you’re looking at $300, so I would be apt to buy it for $400, as long as you had those repair jobs. As I said, if you’ve got an active service department, or you’re a smaller guy who doesn’t have the use of a trailer all the time, you can really bring everything with you more easily. The way I have it right now, I keep the framing nailer and the cordless shingle nailer in my truck. Now, I can go up and just do a quick repair myself instead of having one of my crews go up and do it. PTR: Saving time and money—that’s a very good thing in this economy! Rolling onto the job site with a truck and nothing else and pulling off a small roofing repair without a compressor is something you have to see to believe. It’s a game-changer in that it will literally revolutionize the way you work. Thanks, Robbie, for taking time out of your busy day to talk with us about this tool! I would like to see more from the true pros like this. Good stuff.